Advisory Board: Dvir Rubinshtein, Manager & Security Aviation Consultant, Aviation Security Operation Center, State of Israel. 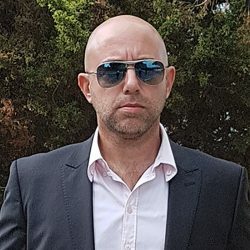 Dvir has a military background in the Israeli Air Force and worked as a Security Manager for Arkia Airlines and El-Al Airlines in Israel and around the world. He held the post of the Security Director of Eilat & Ovda Airports in Israel till 2007 and was appointed to his current position in 2008. Dvir is responsible for all the security clearances and approvals on each airline/flight/aircraft that seek to enter Israel, both in advance and in real time. In addition, Dvir performs security consultation visits and audits in airports and airlines around the world that operate flights to Israel whilst also running the Aviation Security Operation Center (ASOC) that is responsible for the entire Security Aviation industry in Israel.